An effective Ayurvedic herbal powder for external use. 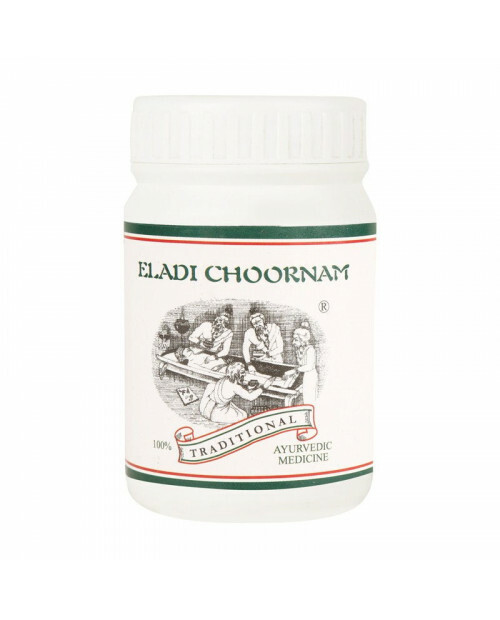 Skin diseases like pruritis, rashes, scabies, psoriasis etc are cured with appropriate application of Eladi Choornam. An Ayurvedic herbal powder made out of Phalani, mamsi, jalaetc, to be used in the treatment of skin diseases. Lesions which affect the external surface of skin are effectively managed with appropriate application of Eladichoornam. Pruritis, rashes, contact eczema, scabies, chronic ulcers etc are treated optimally with Eladichoornam, if used according to the condition. It is also used for whole-body massage (Udwarthanam) as a cosmetic therapy. Udwarthanam with Eladichoornam helps in exfoliation of dead cells and renders refreshed and energetic glow to the skin. It could be used along with water, milk, butter-milk or curd as per the condition. On regular use it removes specks, blemishes and pigmentation from the facial skin. Pruritis, rashes, scabies, psoriasis, contact eczema, chronic ulcers, etc.